Q: My newborn does not seem to like to be EC'ed at all. Should I not be doing this? A: Newborns are still getting so used to the sensations of many new things: hunger, thirst, exhaustion, overstimulation, and elimination. It's not uncommon for babies to cry when they are first being pottied. This can be due to many things. Newborns don't like feeling cold when you take their clothes off. Even the disturbance of having clothes removed (or put on) can bother them. 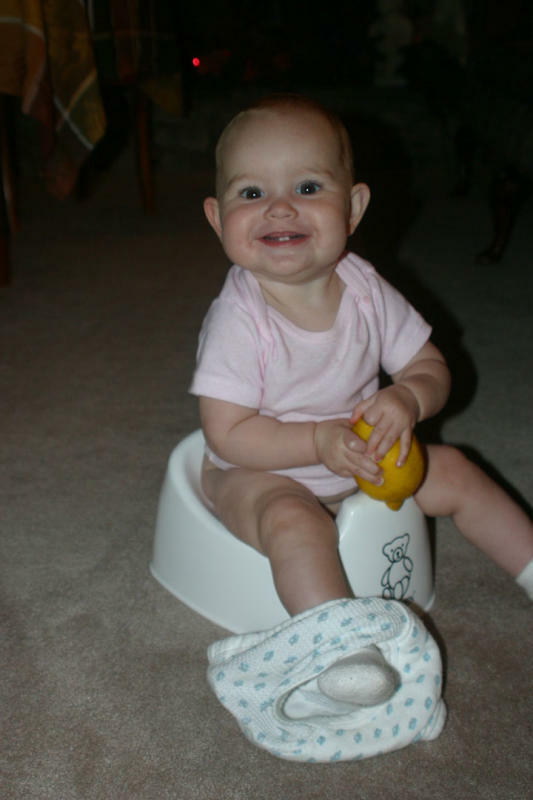 One thing you might consider is keeping your baby diaper free and lying her on an open diaper or absorbent pad. This way the transition to pottying her can be smooth. Another thing to try is pottying her in position (with a diaper) without taking her clothes off. Cue her while she's in this position. Once she is accustomed to eliminating when cued and held lovingly in that position, you can try taking the diaper off. One thing that many parents don't realize is that babies will often cry before or during elimination because they are still getting used to the uncomfortable feeling of a full bladder or bowels.We don't realize that's why they're crying if we don't notice what they are doing. Also, consider a different potty place. She may be more comfortable being held in your lap over a small receptacle than held further away from you over a toilet or sink.